I have a confession to make- yes, yet another one. Although I have heard of Zoe May, I haven’t actually read any of her books……until now that is. Sorry Zoe. 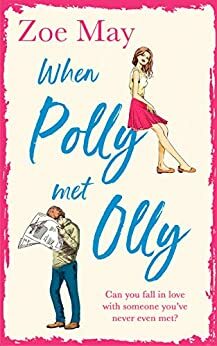 I enjoyed reading ‘When Polly Met Olly’ so much that I now ask myself ‘why the hell haven’t I read one of her books before now?’ I absolutely loved this book but more about that in a bit. I couldn’t help but take to Polly from the first time I met her. In the end I really did feel as though Polly was a friend. I know, I know this book is fictional and therefore the characters are not real but they seem real to me. Polly is a nice, kind, feisty and gentle human being, whose self confidence is a bit shaky. I couldn’t help but hope that things would work out for her in the end. She originally moved to America to attend university but she has stayed in the country. Polly hoped that she would walk into her ideal job following her graduation but reality soon set in and Polly had to find another job to make ends meet. Polly’s passion is photography and she still takes the odd assignment. Polly gets a job with a dating agency, which bends the rules ever so slightly. Polly is sent undercover and she is asked by her boss to spy on the opposition because the opposition is thriving and the agency Polly works for is losing clients. This is when the trouble starts because Polly finds herself falling for the man, who owns the opposition agency. Will Polly find the happiness that she so deserves? Is there room for both dating agencies? Well for the answers to those questions and more you are just going to have to read the books for yourselves to find out because I am not going to tell you. I picked up ‘When Polly Met Olly’ ‘at an ideal time for me. I was worried about something and needed a distraction to take my mind off my worries. This book was definitely a distraction and then some and it cheered me up no end. I became addicted to reading this book from the moment I read the synopsis. The author has a writing style that draws you in and the storyline and characters keep your attention right to the very end of the book. Zoe clearly cares about her characters and this shines through in her writing. She describes the characters so vividly and so realistically that they seemed real to me and leapt off the page as it were. I was so focussed on the story and the characters that I didn’t realise just how quickly I was getting through the book, until I looked up and I was stunned to realise that I was well over halfway through the book. I seemed to race to the finish but in reality it took me a matter of hours to finish the book. This book has a bit of everything- there’s drama, romance, passion and there’s a lot of humour within the story. On more than one occasion, I found I had to stop myself from laughing out loud at something I had read. As I read the story, I was literally picturing the hilarious moments as they happened. In short I thoroughly enjoyed reading ‘When Polly Met Olly’ and I would definitely recommend this author and her books to other readers. I can’t wait to read what Zoe comes up with next but whilst I wait for her next book, I will be definitely be finding her other books and reading them at some point over the next few months. The score on the Ginger Book Geek board is a very well deserved 4* out of 5*.